I made a gauge before knitting my vest, instead of the required 17 per inch, I have 15 stitches per inch. It will make a difference in my project, but I am afraid to go down a needle size, because my row gauge is correct. What is my solution? If it was me, I would go down to the smaller needle size as it is far easier to adjust for an incorrect row gauge than it is to adjust for width. If you stick with the needles you are currently using and do not adjust the number of stitches in your pattern, your knitted pieces will be the correct length but quite a bit wider than pattern designer intended. More often than not the instructions in a knitting pattern about length will tell you to continue knitting until your knitted piece measures a certain length, so if you use smaller needles you just knit a few extra rows until your piece is the correct measurement. 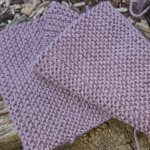 Take the number of stitches in the pattern and divide that number by the number of stitches per inch specified in the pattern to work out the finished width of the knitted piece in inches. Then multiply the number of inches by the number of stitches per inch in your tension (in this case 15). You will also have to adjust all of the shaping in a similar way. So as you can see, adjusting the width is far more complicated that adding a few rows to adjust the length! on the body. This can show you if you are safe. you are within a safe parameter. how much stretch there may be in your final vest. tension swatch, as was mentioned in your answer. knitting project; feel relaxed & ready to go.